Merge Microsoft Outlook Contacts and Calendar items. Duplicate Remover is a simple yet powerful merge software for Microsoft Outlook. It ensures better Outlook duplicate handling by merging contacts, emails, appointments, tasks, notes, journal items and other Microsoft Outlook items. 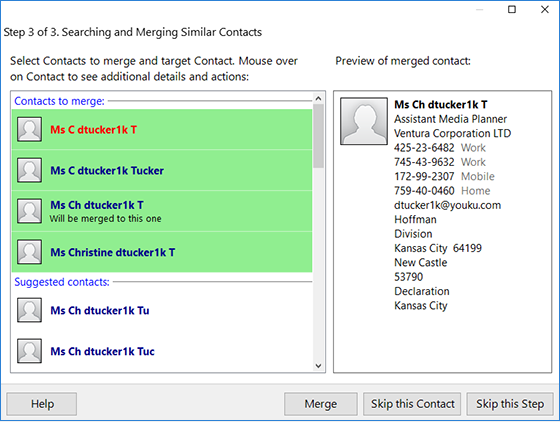 Merge contacts in Outlook 2016, 2013, 2010, 2007, 2003 and 2002. Duplicate Remover is a fully automatic tool without any settings to configure. No need to look through hundreds of contacts or emails and manually merge Outlook contacts duplicates and other duplicate items. Duplicate Remover allows Microsoft Outlook users to find, remove or merge Outlook duplicates quickly and automatically. Multiple duplicate items may cause your Outlook to slow down. However Duplicate Remover can fix it easily. It will merge duplicates automatically. Duplicate Remover will merge duplicate Outlook contacts automatically. In case if you want to merge contacts in Outlook manually, you should download 4Team Duplicate Killer - another advanced duplicate removal tool from 4Team Corporation. Diplicate Killer allows you to select and merge Outlook contacts manually and includes all Duplicate Remover functionality. It will scan your Inbox for incoming mail duplicates automatically. This unique functionality is not provided by any other duplicate removing software available on the market. Click here to learn more. Try NEW Mergix. Remove all duplicate contacts that appear across Outlook, iCloud and Google accounts. The semi - automated tool will save your time while organizing your contact list: cleaning up duplicates, merging similar and removing junk contacts across your main contact sources – Outlook, Gmail and iCloud. Get rid of all duplicated contacts on your PC, iPhone, iPad or Android devices, by merging and updating your contacts data in all accounts. Click here to learn more about Mergix.